Here are several optical illusions for the eye. Found the pictures all around the internet. The Hermann grid illusion. Dark spots appearing and disappearing speedily at the intersections. Same colour illusion. 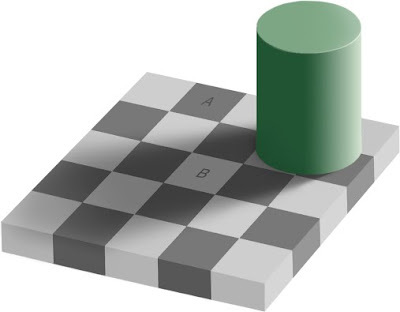 Square A is exactly the same color as Square B. Here’s proof. The Revolving Circles Illusion. 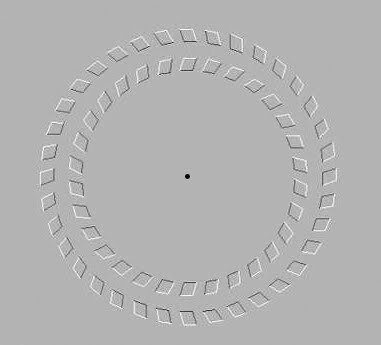 The two circles seem to move when the viewer’s head is moving forwards and backwards while looking at the black dot. Imagine a building where occupants are able to choose their view. Let's narrow our imaginations down to a building of 6 floors where each floor is rotatable. Imagine it by the seaside where each occupant in each floor is given the choice to rotate their side of the view. Here's all 6 units in symmetrical order. And this is what happens when the wind blows. Here's a picture taken from the top.